These fabulous ferns are seen frequently in hanging baskets or container-grown in many residences that favour growing ferns. Ferns are unbeatable for an elegant display of the finest foliage! 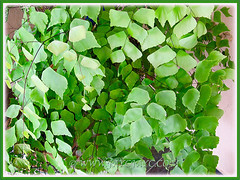 Unfortunately, we hadn’t the chance to grow this particular Diamond Maidenhair as they are not sold in nurseries that we frequent regularly. Love to add to our collection of ferns if opportunity arises. Nonetheless, we got to admire them at Doris Soosay’s home and managed to capture a few shots. 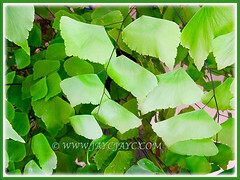 Well, for the time being, we just have to be contented admiring this lovely Giant Maidenhair in our photo archives. 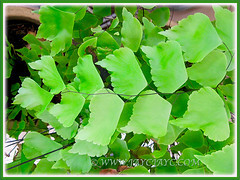 Common Name: Giant Maidenhair, Diamond Maidenhair, Trapezoidal Maidenhair. 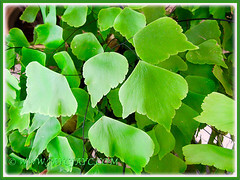 Etymology: The genus name, Adiantum comes from the Greek word adiantoj, meaning unwanted and referring to the water-repellent fronds. The species epithet trapeziforme from Greek trapezoid, meaning trapezoidal- shaped leaflets. Origin: Native to the tropical rainforests of Central and South America. 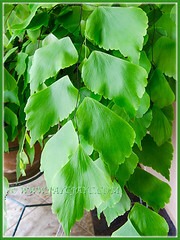 Features: Adiantum is a genus of maidenhair fern that consists of about 200 species. These long-lasting plants are popularly grown for their dainty and attractive foliage. Adiantum trapeziforme is a large terrestrial herb with clustered leaves to 1 m long, bearing four-sided leaflets that tend to point downwards. The newly unfurled leaflets will have a pinkish tinge. The stipes and rachis are wiry and coloured brownish black. Leaflets are irregular, bipinnately or tripinately compound, and the fronds are trapezoid-like in shape and have a graceful arching habit. As the rhizomous fern matures, spores are formed on the marginal underside of fronds and can be used for propagation. 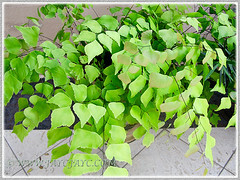 Culture (Care): Adiantum trapeziforme is typically easy-growing and needs minimum care. Given its native habitat in the tropical rainforests, just remember its basic requirements are sufficient light, moderate to warm conditions, high humidity and moisture. Light: Grow in partial shade with preference to bright light or filtered sunlight. Avoid full or direct sun that will scorch its leaves. Moisture: Require lots of water regularly but not waterlogged. It loves a warm and humid environment. Soil: Humus enriched, moist and well-drained soils, preferably light and loamy. Others: Cut off dead or withered leaves with scissors to rejuvenate growth and keep it aesthetically pleasing. 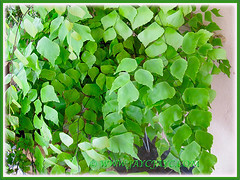 Mist the foliage weekly to keep it dust-free. Browning tips and yellowing fronds are signs of dry air, thus increase humidity if needed. Feed once fortnightly with a liquid fertilizer for foliage plants. Generally free from serious garden pests. Hardly affected by aphids, scale or mealybugs. It is frost tender and requires temperatures between 15°C to 30°C. Since it’s not frost tolerant, advisable to grow indoors as a houseplant or in a green house with sufficient bright light and accepted temperatures. Propagation: By division of clumps or spore from the underside of fronds, the former being the easiest. Simply remove the fern from its container and gently tease off the potting soil. Cut the rhizome into pieces and pot them separately into small pots filled with moist and free-draining soil. Water and locate them at a warm and semi-shaded area.